Hockey Networking Night in Ottawa! Name: Hockey Networking Night in Ottawa! 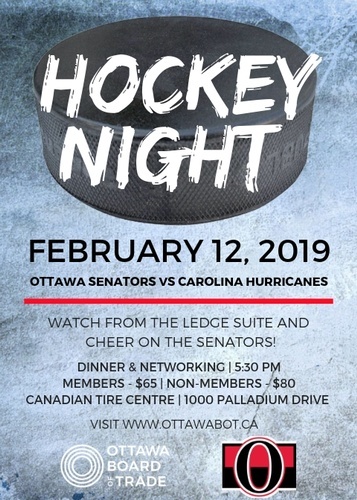 Help us cheer on the Ottawa Senators as they take on the Carolina Hurricanes! The evening will present an opportunity to network with fellow Board of Trade and community members and make new connections in an informal setting. Join us at The Ledge Bar at 5:30 PM for a buffet style dinner and networking! Puck drops at 7:30PM. Sens jerseys are encouraged! Reserve today. Ticket Includes admission to the game and dinner buffet at the Ledge Bar.